Description: Treasure Hunt is a new seasonal event, where you can be a treasure hunter, taking part in a mysterious chase and earn yourself some wonderful rewards! Be confused about it? Let's explore it together! 1. 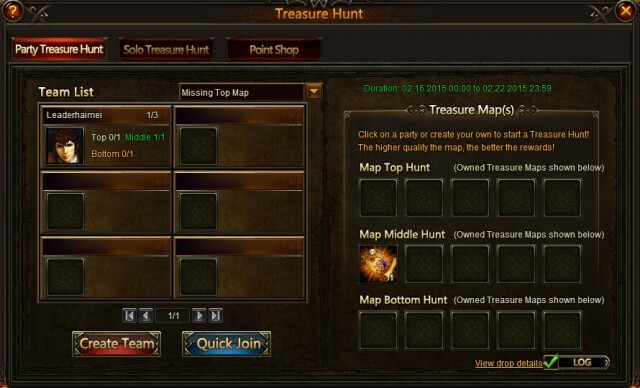 Treasure Maps are necessary items to take part in the treasure hunt, which can be received in many different ways. Treasure maps are divided into 3 different pieces. When the 3 pieces are synthed, players will get the treasure chests, in which players have the opportunity to get one of the following items, and even superior reward. 2. Find other players with the missing pieces of the map and embark on a treasure hunt together, according to what Treasure Maps they possess.The level of the map assembled will determine the available treasure. 3. If a player finds all 3 pieces of a map, he can embark on a solo Treasure Hunt. 4. 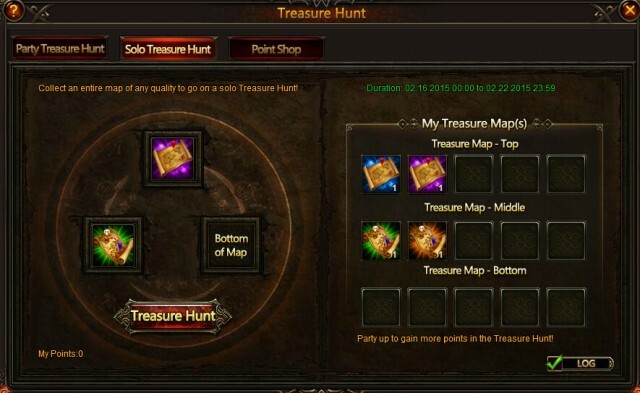 If players would like higher quality Treasure Maps, they can visit Map Enhance. Better maps can be obtained, meaning more valuable treasures! 5. 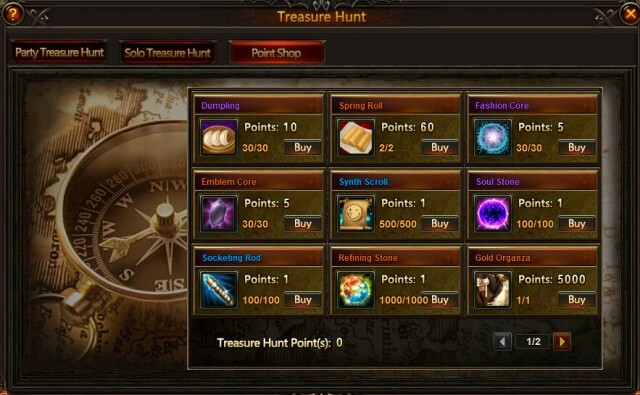 Every single treasure hunt gives players points for item exchange in the Point Shop. There are many items newly added, such as Sky Archer, Blade Wings, Dumpling, Spring Roll and Refining Stone. Choose exactly what you want! Description: Fulfill certain to win extra Treasure Hunt Chests! Description: Consume certain amount to win extra Treasure Hunt Chests! Description: Spend certain amount to buy more Treasure Hunt Chests! More exciting events are coming up through Feb 16 to Feb 22 (Server time), check them out in the in-game Hot Events menu now! LoA_Valentina Shows Up in House of Cards! LoA_Compete for Luminous Steed in Resource Tycoon! LoA_Djinni's Merchant Brings You Superhuman Costume! LoA_Lucky Tree Brings you Good Luck!